Approaches all leaders can use to reach students of color. Educators' efforts to make good on their commitment to educate all students to high levels have largely fallen short. In many classrooms across the United States, there remains a gap between what black and brown students learn from their teachers and the achievement of white students. Prompting even greater urgency, students of color will make up the majority in U.S. public schools within the next five years (U.S. Department of Education, 2016). We need to learn how to teach students of color now. It is no surprise, then, that policymakers have taken great interest in research showing students of color perform better when taught by teachers of color. Researchers explain that teachers of color are more likely to (1) be seen as positive role models, (2) have high expectations, (3) implement culturally responsive teaching, (4) develop trusting relationships with students, and (5) advocate for equity and against racism (Egalite & Kisida, 2016; U.S. Department of Education, 2016). In fact, there is some evidence that their influence through role modeling, culturally responsive teaching, and advocacy is also beneficial for white students. Unfortunately, educators of color make up only 20 percent of today's teaching workforce (Geiger, 2018) and 40 percent of schools have no teachers of color on staff (National Collaborative on Diversity in the Teaching Force, 2004). For all students' sake, our education system must get better at attracting and retaining teachers of color. But this is a long-term strategy. In the meantime, there is no reason we cannot draw upon the lessons we've learned from research. Teacher leaders and principals of any color, working together, can ensure that their schools are organized to support the kinds of conditions modeled by teachers of color that help all students succeed. Exposure to diverse role models serves everyone well. School and district administrators can use their positions to engage local authority figures who are people of color, model collaborative relationships with these individuals, and bring them into school to interact with students. At the same time, teacher leaders can ensure these visits have meaningful curricular connections that lead to authentic relationships. For example, community members can join classrooms to conference with students on their writing, read to students, or provide feedback during classroom exhibitions. These positive role models can inspire and encourage students, and help them value high achievement. Teachers of color have been observed to be more responsive to students who are struggling, to persevere in reteaching these students until they respond, and to persist in pushing students to work hard. They are less likely to demonstrate the "bigotry of low expectations," in which pity is disguised as compassion. Principals play a key role in setting high expectations and holding all teachers—regardless of skin color—accountable for upholding them. They can best succeed in this endeavor with the support of teacher leaders, who can foster a culture in which all teachers make their practice public, support each other in addressing classroom challenges, and share mutual responsibility for the results of all students. Culturally responsive teaching refers to the way teachers use their knowledge of students, as cultural beings and as learners, to inform the pedagogical and content choices they make. Teachers' instruction must recognize, for example, the diverse perspectives, communication styles, and experiences of students, and tap into them as assets that can advance learning. Students deserve to see themselves in the curriculum and to learn from the perspective of others. School and district leaders must protect the time required for teachers to learn to teach in more culturally responsive ways and to procure high-quality, relevant resources. Teachers leading from the classroom are essential for supporting the shift to culturally responsive practice; these lead learners can work alongside their colleagues, share their challenges, and make it feel safe to take necessary risks. Deep learning requires risk taking, and most students—in fact most people—need a reason to take that leap. We're more likely to trust those with whom we have something in common; but until we get to know each other, all we can see is what's on the surface. Principals and teacher leaders should invest in creating schoolwide routines and traditions that foster personal connections that are more than skin-deep. Establishing a tradition of student work portfolios that celebrate the whole child, holding three-way conferences that honor students and families as partners in school success, and planning service-learning field trips that cultivate community are great ways for leaders to prioritize trust building among students and staff. 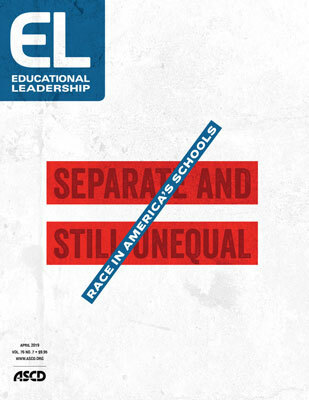 Teachers of color may be the first to recognize injustice and may have more practice with the uncomfortable task of raising objections, but all educators must commit to being advocates both for equity and against racism. Principals and teacher leaders must learn how to have courageous conversations about race, and model such conversations for students. They can read books (Glenn E. Singleton's Courageous Conversations About Race), subscribe to podcasts (NPR's Code Switch), watch TV shows (ABC's black-ish), and watch movies (Remember the Titans) that explore hard-to-discuss race-based topics. If this can be done as part of a faculty-wide effort with the endorsement of the principal and guidance of teacher leaders, there is a better chance of reaching the teachers who stand to benefit the most—not just the ready volunteers. In the long run, we'd like to see students of color have such successful experiences in schools that they are eager to join the teaching profession themselves. Until that day, and even in service of it, we can take note of the practices that help teachers of color make an important difference for students of color, and collaborate across levels of leadership to embed these practices in our schools. Egalite, A., & Kisida, B. (2016, Aug 19). The many ways teacher diversity may benefit students. Washington, D.C.: Brookings. Geiger, A. (2018, Aug 27). America's public school teachers are far less racially and ethnically diverse than their students. Washington, D.C.: Pew Research Center. National Collaborative on Diversity in the Teaching Force. (2004). Assessment of diversity in America's teaching force: A call to action. Washington, D.C.: Author.